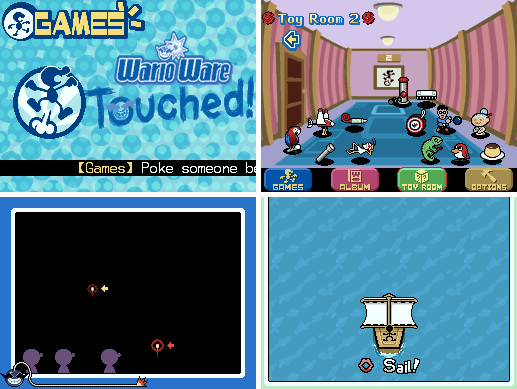 Wario and his game developers are back with a new selection of touch screen microgames. 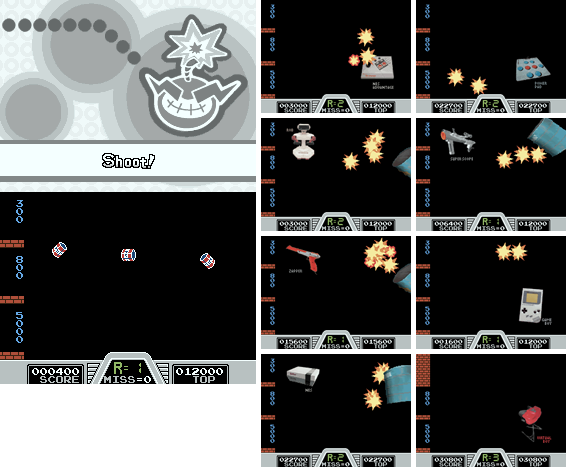 By touching, rubbing, spinning and blowing, you have to clear each microgame in a few seconds and aim for the high score. Each character specialises in a particular kind of input. Jimmy T is all about rubbing, while new girl Ashley requires you to drag things around. Crygor is spin master, and Mike requires you to blow on the microphone. You can unlock loads of strange toys that let you play with the stylus. Some have no purpose, such as the custard pudding, while some are full minigames in themselves. 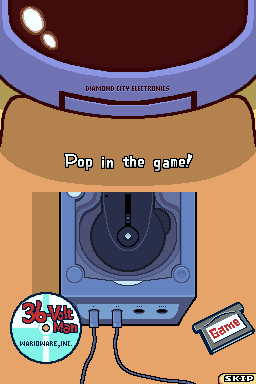 The brief minigame during the intro involves dropping a GameCube game "36-Volt Man" into the system. There is also a Game Boy Advance cart on the floor. 9-Volt and 18-Volt then play the game, which plays sound effects from Super Mario Bros. There is a poster of Diskun (the mascot for the Famicom Disk System) in the background. 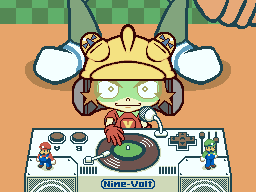 9-Volt's turntables have mini Mario and Luigi figures on them. Lose a microgame and they fall over. The decks also feature the words "Nine-Volt" written in the style of the Nintendo logo, and the layout resembles an NES Controller. 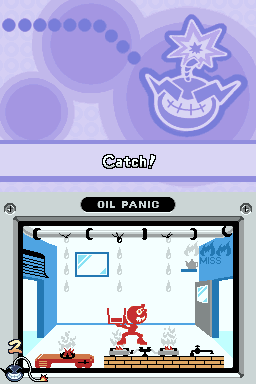 As in previous WarioWare games, 9-Volt's microgames are all themed on classic Nintendo games, systems and toys. Based on Super Mario Bros. 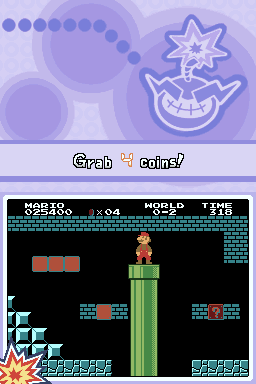 Collect the specified number of coins from the blocks and Mario will appear. Sometimes you have to grab coins from secret blocks. 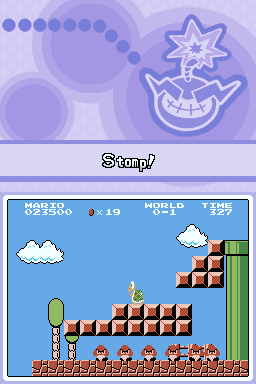 Based on Super Mario Bros. Poke the enemies to clear them off the screen to make Mario fly across the screen. 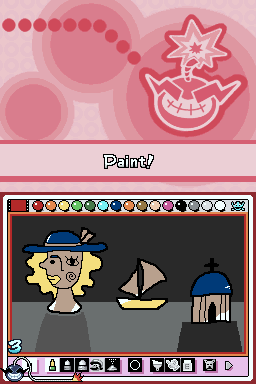 Based on Mario Paint. Scribble across the screen to fill in the white pictures. 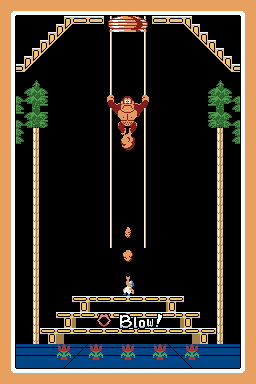 Based on Donkey Kong 3. Blow into the microphone to make Donkey Kong hit the top of the screen. Based on The Legend of Zelda and Zelda II: Adventure of Link. 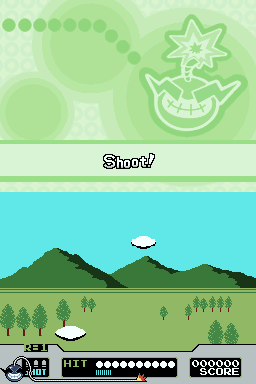 Tap the fairies that appear on the screen and Link appears. In the original The Legend of Zelda scenes, Link holds up an 8-bit Nintendo DS. Based on Metroid. Keeping pulling Metroids off Samus to keep her energy above 0. This microgame replaces the Japan only "Famicom Detective Club" microgame in the non-Japanese versions. Based on Famicom Detective Club. Tap the part of the investigation scene that differs from the scene shown on the top screen. 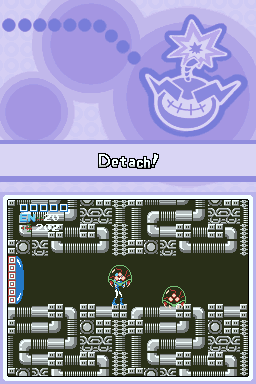 This microgame is only in the Japanese version, and is replaced by the "Metroid" microgame in other versions. Based on Balloon Fight. 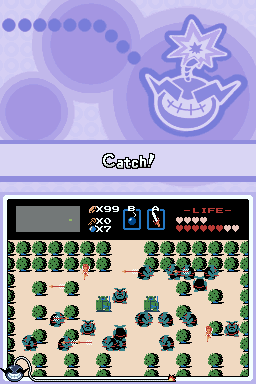 Pop the balloons of the enemy Balloon Fighters without popping the hero's balloon. Based on Duck Hunt Game C. Tap the clay pigeons as they fly off into the distance. Based on Hogan's Alley. Tap the gangsters to shoot them, but don't shoot the civilians. Mario in Super Mario Bros.
Based on Ball. Move the doll's arms to catch the juggling balls. The game is erroneously named "Toss Up" in the PAL version, which was the title of an unofficial copy of the game by Mego/Time Out. Based on Flagman. Copy the Flagman's instructions before time runs out. Based on Lion. Move the tamers up and down to keep the lions contained in the cage. Based on Oil Panic. Move the man so he catches all of the oil drops. Fighter Fly from Mario Bros.
Lakitu from Super Mario Bros.
Koopa Paratroopa from Super Mario Bros.
Rotate the 3D Nintendo handheld system to find the button displayed on the top screen and press it. The systems are the Game Boy Advance, Game Boy Advance SP and Nintendo DS. 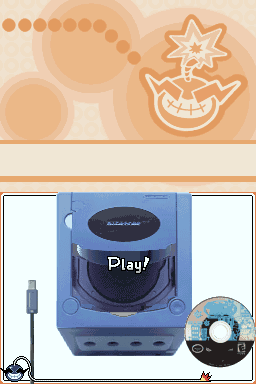 Insert the WarioWare, Inc.: Mega Party Games disc into the Nintendo GameCube and close the lid. On the later difficulties, you also have to insert the Controller. 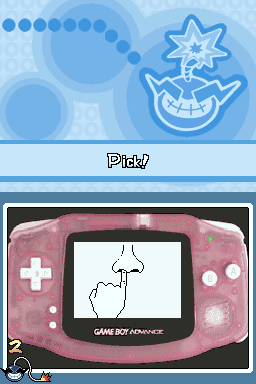 Press the buttons on the on-screen Game Boy Advance to beat the Gold Digger microgame from WarioWare Inc.: Mega Microgames. Hit the A Button on the NES controller to beat the game. There are three fictional games that appear (see notes). Blow into the Famicom controller microphone to beat the game. There are three fictional games that appear (see notes). 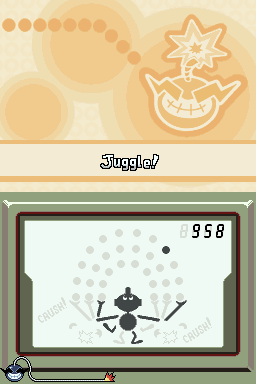 You can rack up a high score by juggling the cans against a wall for a while before landing them, and this changes the hardware that appears from the oil drums. To make the NES appear you have to get over 20,000 points, and to get the Virtual Boy you have to get over 30,000 points. 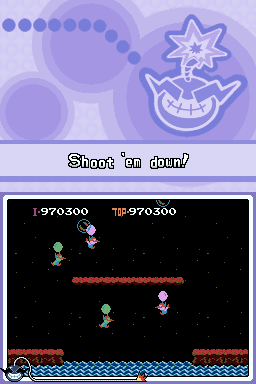 The space shooter is similar to Namco's Galaga. An Indiana Jones-style version of Nintendo's NES port of Irem's Kung Fu. 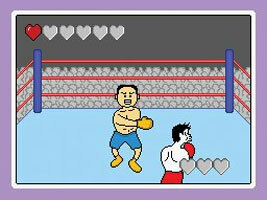 A boxing game based on Punch-Out!! 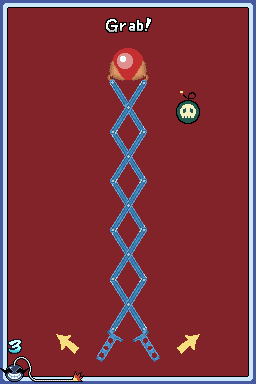 and originally Jimmy T.'s boss stage from WarioWare Inc.: Mega Microgames. 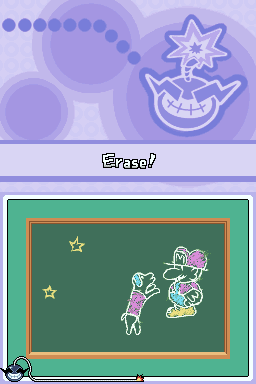 In Jimmy T.'s "Chalk Full" microgame, you sometimes have to clean a drawing of Mario from the chalkboard. 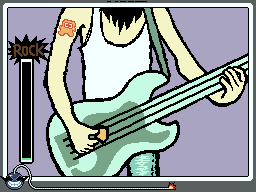 In Jimmy T.'s "Power Chord" microgame, the rock star has a tattoo of Diskun on his upper arm. Diskun was the mascot for the Famicom Disk System. 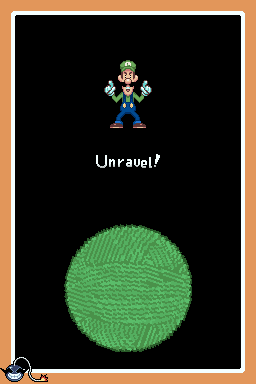 In Crygor's "Spin a Yarn" microgame, the third difficulty level has you unravelling a green vest. Hiding inside is Luigi from the Mario series, who jumps and makes an 'L' shape with his body. 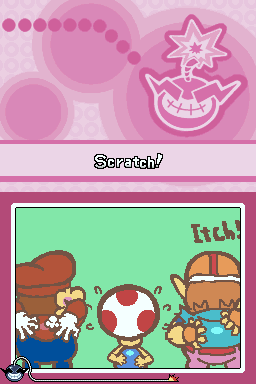 In Warioman's "You Scratch Mine" microgame, you have to scratch Wario's back. On the second difficulty level you also have to scratch Mario's, and on the third difficulty you have to scratch Toad's as well. 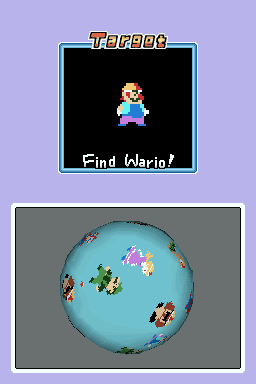 In Warioman's "Where's Wario" microgame, you have to spin a 3D ball to find the picture of Wario. On the hardest difficulty you will have to search through a bunch of pixellated characters to find the 8-bit style Wario sprite based on the arcade Mario Bros. Other characters include Luigi, Goombas and Koopa Troopas from the Mario series, all wearing Wario's yellow headgear. 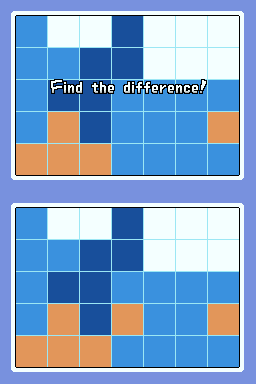 In Mona's "Quite Puzzled" microgame, you have to solve a sliding puzzle by moving panels to match the top screen. One of the solutions shows a joker card with a merman on it. This was an actual Joker card from Nintendo's early days as a playing card manufacturer. "Get me out of all these clothes! I'm sweating like a Goomba at a plumber parade!" This is a reference to the Mario series. In Crygor's boss stage "Living Room Rally", the remote control is the same red and gold design as the controller for the Japanese Famicom. 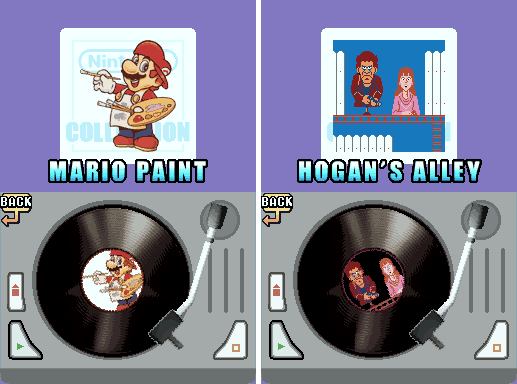 #3 is the band from the Garage Rock microgame in WarioWare, Inc.
One of the toybox items that you unlock by playing the game is called Wario Paint. The game itself is a limited version of Mario Paint, and the toy icon is the Japanese boxart for the game, with Wario's nose where Mario used to be. 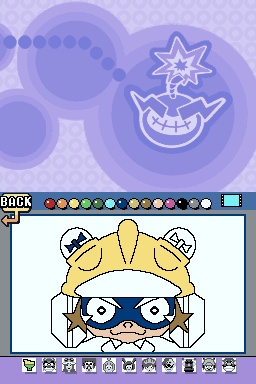 In this mode you can select a drawing of a WarioWare character and colour them in with the colour bar along the top of the screen. The logo of the Games section is Mr. Game & Watch. He is leaping into the air with a cloud emnating from his backside. 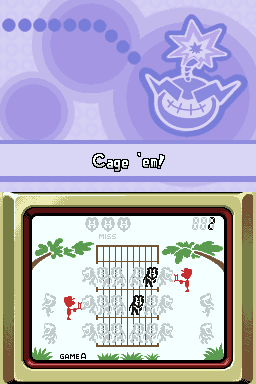 In the background of the second Toy Room is a picture of Mr. Game & Watch. 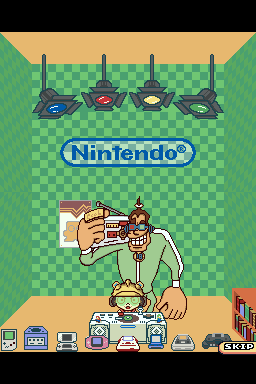 In Wario's Microgame, "Big Bang", you are watched by a bunch of Mr. Game & Watches. 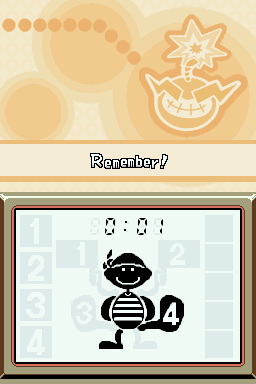 In Mike's microgame, "Admiral Blowhard" it looks like the boat driver is Mr. Game & Watch. When you complete a character's set, they go to the Hawt House. If you look on the top screen you can see a number of flying objects in the sky. One of these flying objects is Satoru Iwata, the president of Nintendo. 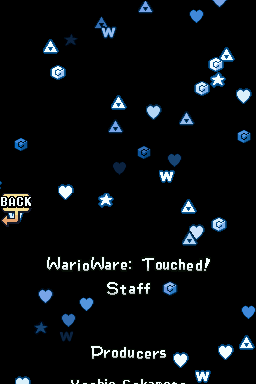 As in earlier WarioWare games, during the credits you will see the Triforce from the Legend of Zelda series and the Gamecube "G" logo.